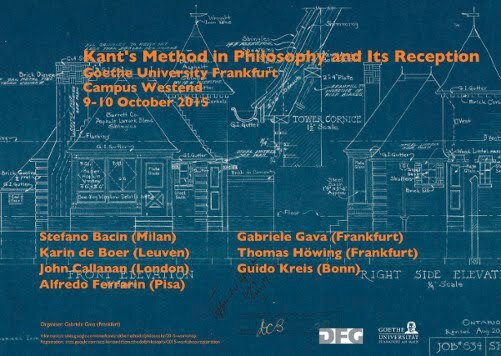 We are pleased to announce the first workshop on “Kant’s Method of Philosophy and its Reception”, which will be held at the Goethe University of Frankfurt, on October 9-10, 2015. The workshop is part of a 2 years project on Kant, transcendental strategies, and philosophical antinomies that Gabriele Gava is running at Goethe University Frankfurt. The present initiative will consist of two workshops, taking place respectively in Autumn 2015 and Spring 2016, which will investigate historical and systematic issues related to Kant’s considerations on the method of philosophy. The first workshop will approach the analysis of Kant’s method in philosophy from the vantage point of its various receptions, both critical and favorable, in the history of philosophy. Philosophers belonging to different traditions (like German idealism, neo-kantianism, phenomenology, pragmatism, analytic philosophy, etc.) have found his method as deserving close attention. From this very diverse appropriation, we get contrasting representations of Kant’s method that are sometimes difficult to put together in a coherent picture. On the one hand, the workshop will thus highlight what these various traditions have found important or worthy of strong criticism in Kant’s approach to philosophical argument and detect the distortions of Kant’s position of which they are sometimes responsible. On the other hand, it will offer a fresh look at Kant’s philosophical method in order to draw attention to aspects of his thought on the matter that have been misrepresented or neglected. For any question concerning the project please write to gabriele.gava@gmail.com. For further information please check this link.